One day a giant went to play in the Namibian desert. He made a toytown village out of bits of things he found lying around; the husks of scorpion shells, desiccated bones, sand-sifted diamonds, and brightly colored plaster. He lined up his toytown houses in neat little rows, serviced them with a tinker rail-line, then sat back and sighed in contentment. The next day he walked away and left the toytown to the sands. 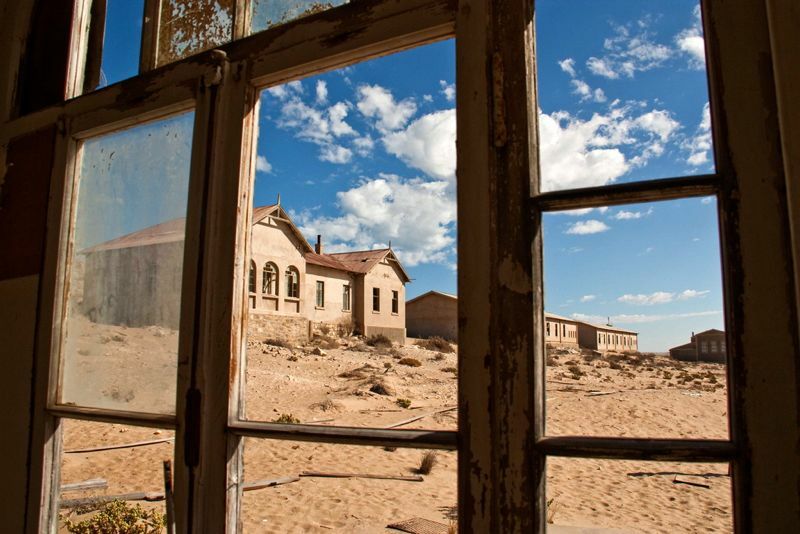 Kolmanskop is a ghost town in the deserts of Namibia, built by the DeBeers mining company in 1908, abandoned in 1956 after diamond prices crashed. 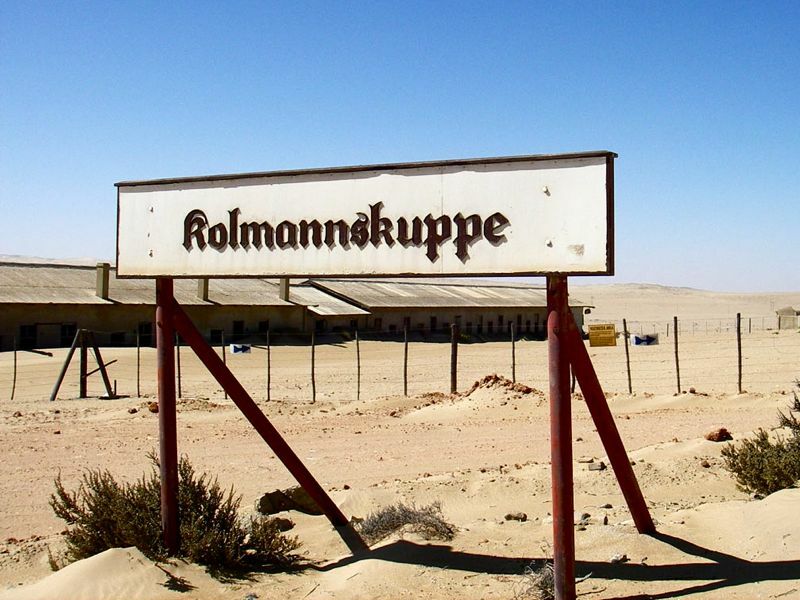 The town is named after a transport driver named Jonny Coleman (Kolman) who took shelter from a sandstorm on a hill (Skop) in the vicinity. 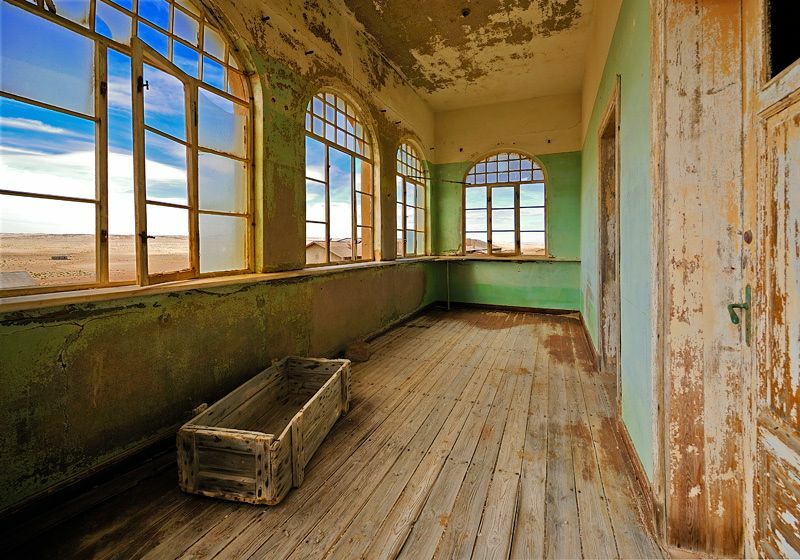 Kolmanskop toytown, drifting into the dunes. 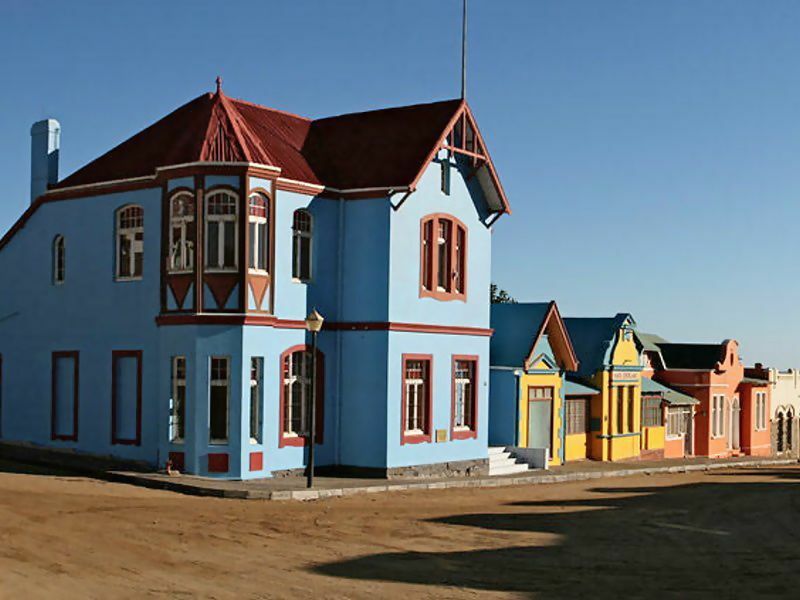 DeBeers is a Dutch company, and they built their miners` town in a traditional Dutch style, incorporating all the infrastructure of a `modern` town into their theme parkish oasis-mirage; a hospital, casino, ballroom, skittle-alley, the first x-ray station in the southern hemisphere, and so on. 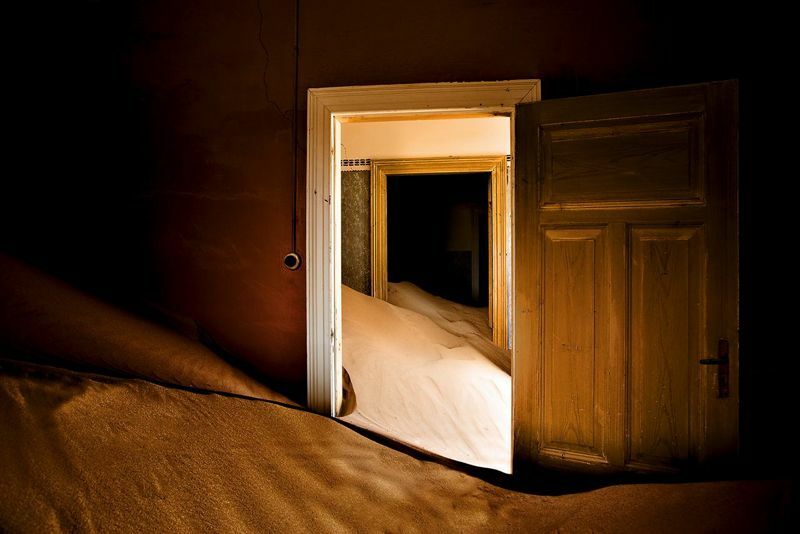 When they left the place behind, the sands rolled in, pushing open the doors and promulgating, desertifying rooms and inching their way up the walls. Over 54 years of abandonment, many houses have been crumpled from the top down, their living rooms opened to the sky. 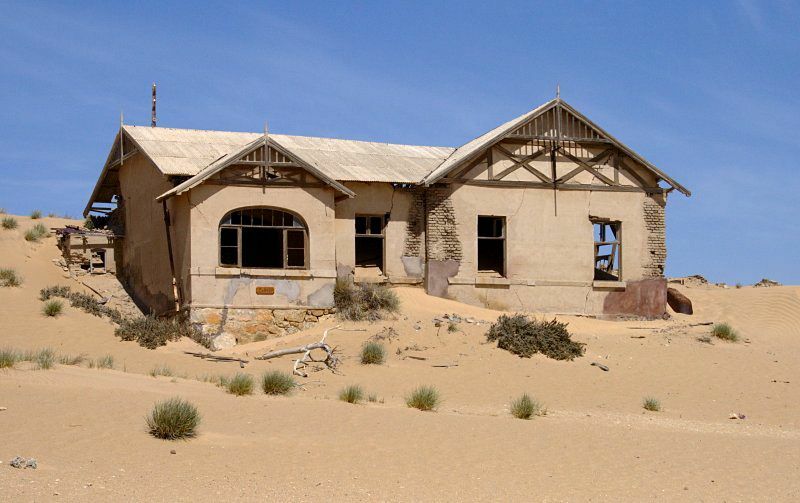 Now it is a popular tourist destination, with the Nam-Deb (Namibia-DeBeers) company running jeep tours. House made of Lego bricks. 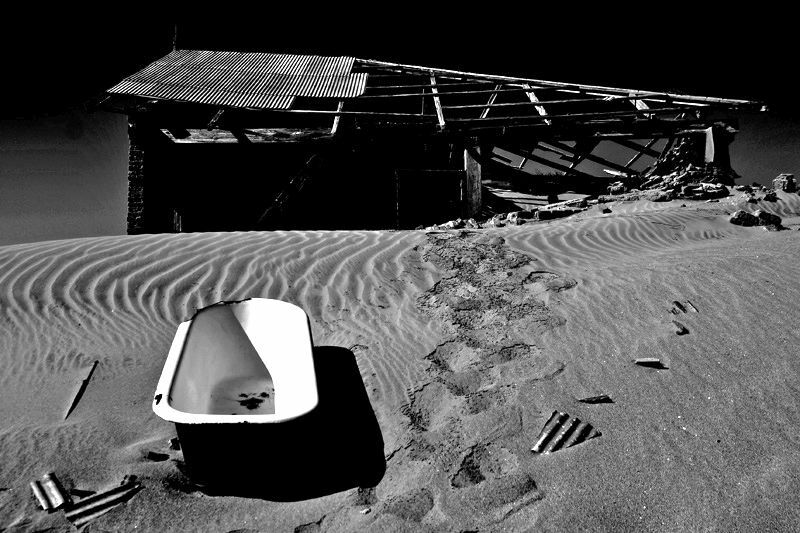 Bathtubs are the boats of the desert ocean. 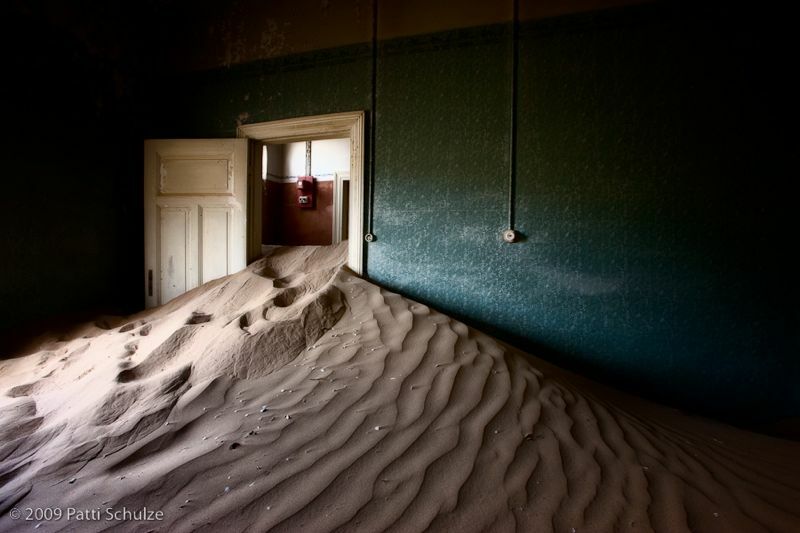 Rooms once filled with miners’ families now abound with sand. I first thought this photo was a surrealist painting. But it’s real. 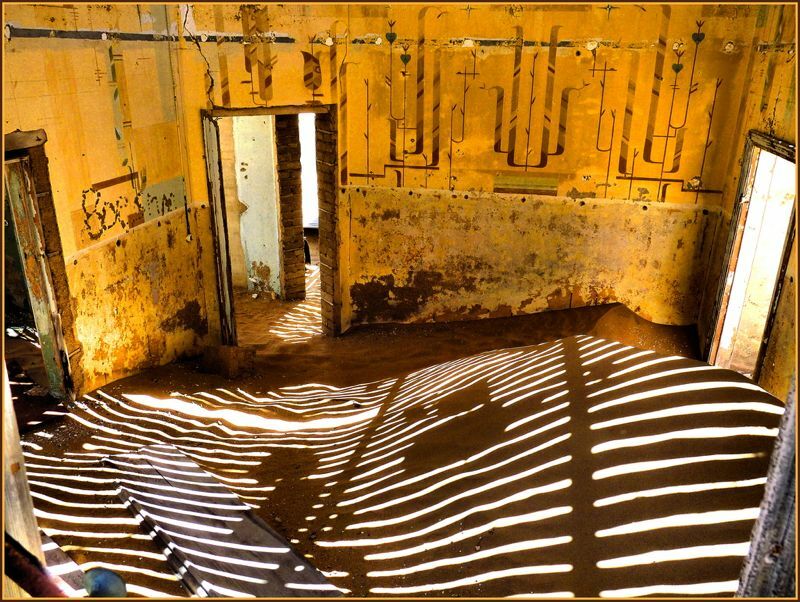 A slatted roof stripped of shingles by sandstorms paints stripes over the sand. In high school I learned about desertification, the process by which good arable lands become turned to dead wastes of sand. It fascinated me at the time, and I set my first novel `Jethro`s Fall` in a single remaining walled city beset on all sides by a spreading desert. In one climactic scene Jethro stands atop the wall and watches as the city`s immense fans push back the steady advance of the sands. 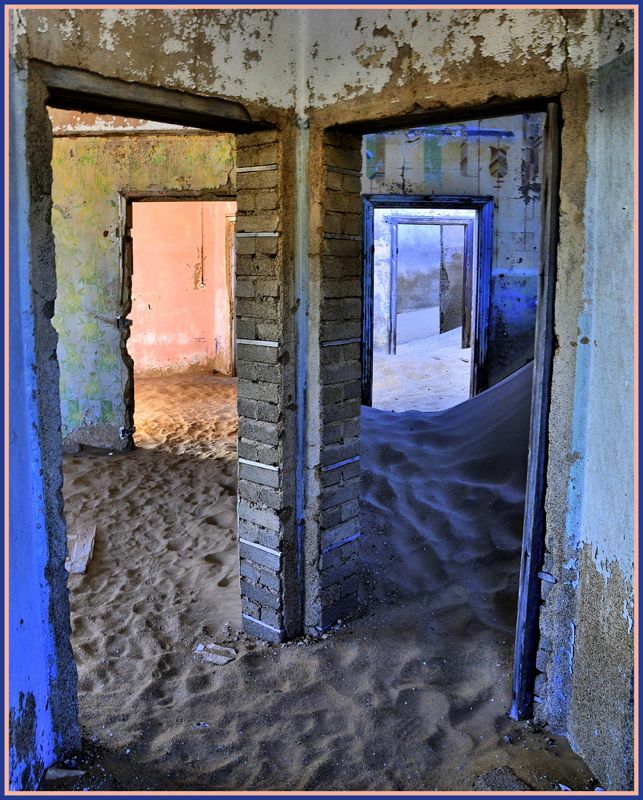 Underneath the encroaching dunes he sees the remnants of streets and buildings, ground under the weight of the sand. He begins to understand in that moment, that soon their city too will be gone. 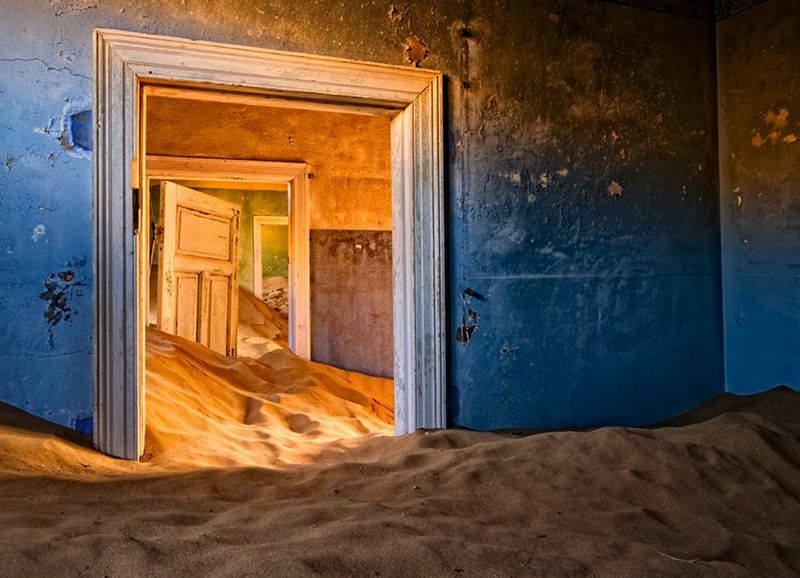 They can`t push back the sands forever. The book isn`t yet published, but I`m reworking it and hopeful for its future. Can these prints be purchased? 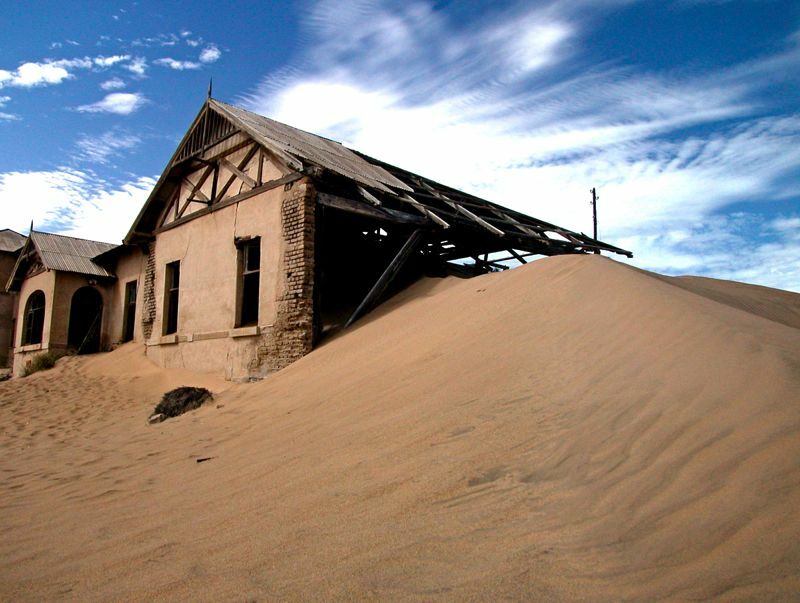 then first time I saw this place was in a film called “Dust Devil” Incredible. 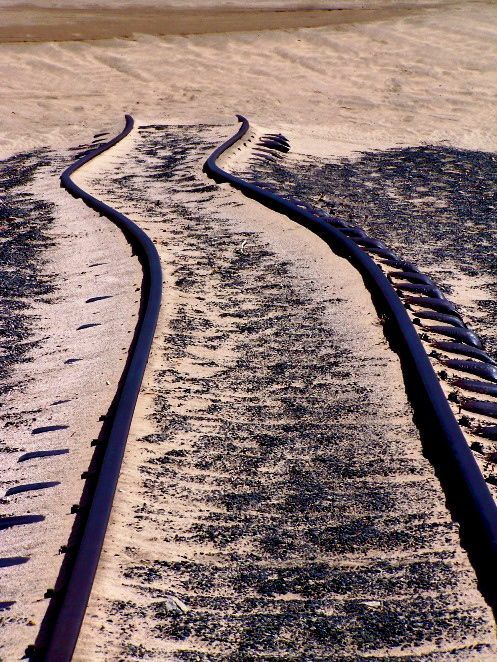 Wonderful, beautiful, evocative photos. Thank you. Imaginatively, given enough changes in the “sands of time” with rising oceans, a retaking of these photos might depict them as beaches. 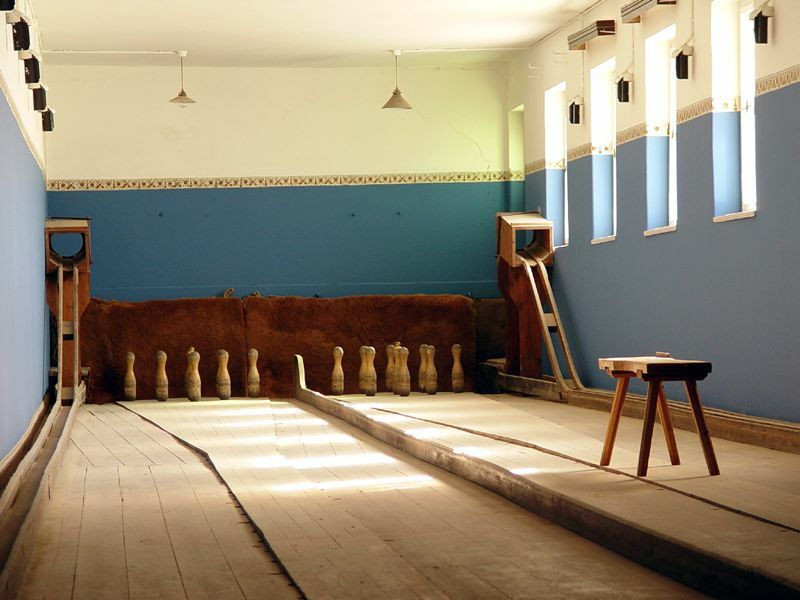 The style of the constructions in Kolmanskop is certainly German, not Dutch. 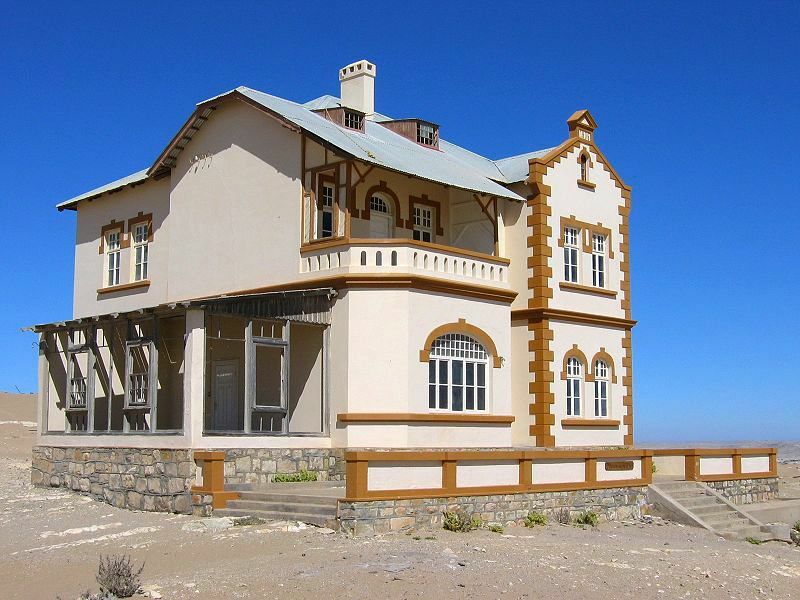 At the time the area was known as German South West Africa (Deutsch-Südwestafrika). The miners were German, not Dutch. South Africa occupied it and ran it till independence on 21 March 1990 as Republic of Namibia after years of war with South West Africa Peoples Organization. The name is Afrikaans for Coleman’s hill, German: Kolmannskuppe as seen in one of the above photos, very much in a German style script. BTW, some very good pictures indeed! How wonderful, after those surreal pictures, this inside into a story, that its says so much about mining, and the forces behind. Grateful…If you ever see this, Jose Costa. BTW…Classic Japanese Film, “Woman in the Dunes”…many moons ago, disturbing, unforgettable.